Our office is in the Atlas Mountains (Imlil) but we can easily meet you in Marrakech if needed. Because the High Atlas can involve some challenging elevation gains and losses over continuous passes (2000 m+), most High Atlas treks are rated medium, meaning you should have recent experience hill hiking, carrying a light day-pack, and a tolerance for climate changes. You will need light hiking style shoes or boots with a full-tread sole and good quality outdoor clothing. Spring and fall, snow remains on the high peaks. Nights might be cold and the days can be hot and sunny. We have a list of what you will need to bring below. Fitness requirements You should be confident of your fitness and endurance levels. The main recommendation is a sense of adventure! There is no age limit providing that you are in reasonable physical shape and you are aware of the rigors of trekking in higher elevations and have proper travellers insurance. Please make a point of telling us (quietly if you wish) if you have any medical condition/allergies or are on any medication that you think we should be aware of. We are out there for a great time and we want you to feel comfortable in your environment. 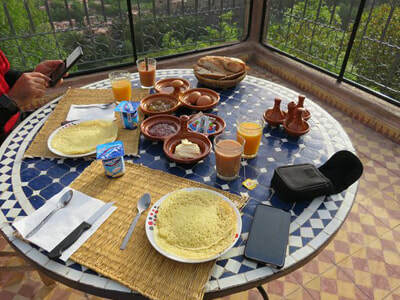 Accommodation in villages "houses" called gites with kitchens, sleeping areas and showers, or dome tents or, since Morocco is one of the the few areas of the world where warm temperatures combine with an absence of insects, you can sleep under the stars. Nothing can compare with a night under the brilliant starlight of North Africa. Tents, mattresses, fully equipped kitchen, food and personal baggage are carried by mules. You carry only a day pack for your water, snacks, camera and clothing. We have a limited number of sleeping bags for hire in our Shop, so you might be required to bring your own. All Food is included on trek and is very healthy, including Couscous, Tagine, fresh eggs, fish, olives, nuts and fruit. Please let us know whether you are vegetarian. Apart from eggs and fish (Tuna and Sardine) often served at lunch time with vegetable salad, there is not a lot of meat and when meat is available, separate dishes such as vegetarian Tagine is prepared. Bottled water is usually available to buy from villages your trek through, but you might need to use your own method to purify water ( in some of our treks, we can include this with little extra fee ). Some people like to bring their own treats and food supplements if they have special dietary requirements. If you like to drink herbal teas, bring your own. Moroccan tea tends to be a real energy booster with Gunpowder green mixed with copious amounts of sugar (refreshing and delicious!). Sugarless tea can be requested. soap / shampoo / toothpaste / toothbrush etc .. The services of a qualified, experienced English speaking mountain guide. any expenditure of personal nature ; hot showers in some of the gites or mountain huts. 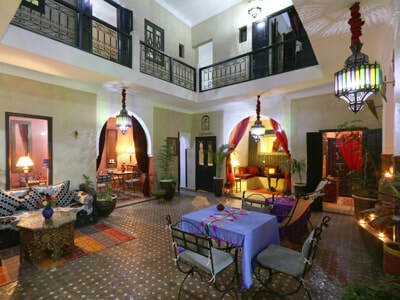 We do not automatically include accommodation in Marrakech as part of the package but we can arrange accommodation – and airport transfers – if you wish. Please let us know if you would like us to do this. We do include transport to and from Marrakech in our itineraries. Yes, the duration and routes of the treks can usually be changed to suit your needs. For some treks variations are already indicated. This should to be specified and agreed in advance although every effort will be made to accommodate this en-route. Some changes may be necessary due to prevailing weather conditions and it remains he prerogative of the guide to vary the itinerary in the interest of safety. By PayPal if you are happy to cover the transfer fee. All treks started, and stopped by the fact of the customers, or the atmospheric conditions, or of the particular conditions, or cancelled flight, can give place to no refunding. In the case or the atmospheric conditions or the state of the paths, or snowing up, oblige to stop the trek, a solution or a route of replacement will be proposed to you. But will be able to give place to no refunding. Deposit only: 30 Days beofre departure. No, except for treks to the Saghro and Sirwa regions where we require a minimum number of 4. For other treks a good number is between 4 and 12. But we cater for sole travellers and large groups. Grade 1 walks (Easy)Tend to be short day walks and rambles at low altitudes. Grade 1 walks can be enjoyed by anyone who leads a reasonably active life and no special preparation is required. Grade 2 walks (Moderate) Will usually involve some longer walks (4-6 hours/day) at low altitudes (below 3000m). Some previous hill walking experience would be beneficial but these walks should be within the capabilities of those who lead a normal active life. Grade 2 walking tours may contain some optional strenuous days, and in order to get the best out of the trip we would advise that you tone up your fitness before you join. Grade 3 walks (Strenuous) Are for the more serious hill walker and a higher level of physical fitness is required. Walking days are normally 6-8hours and may involve up to 900m or more of ascent and descent. You should be prepared for several consecutive days walking, often at higher altitudes, so stamina is important. The best time to visit Morocco is entirely based on when you are free. The country has a mild climate and boasts some of the sunniest days annually in the world. The desert in the south can become quite unbearable in the summer months, so a visit in April and May or October through December ensures preferable temps there. If you plan to come to the High Atlas Mountain region of Morocco, there can be some rain and much snow at altitude from November to March. Many tourists come to Morocco in July and August, when accommodation can be next to impossible to find. A visit in the spring or fall clinches the countries best weather in all the regions. Top Tips - Morocco Tours : Don’t ever think that you can hike in Morocco alone. The crisscrossing mule tracks and lack of any common language out in the mountains is sure to get you stranded. Book a tour guide through your tour operator before you come. Make sure to ask anyone before taking a picture. Most people won’t mind as long as you ask. It’s polite and shows that you respect their beliefs and culture. 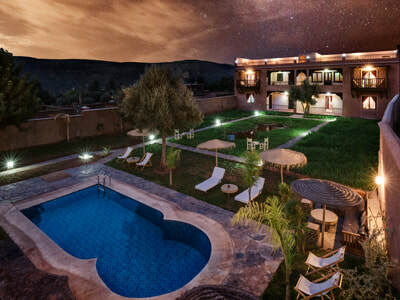 Travelling to the south of Morocco in the summer will leave you sizzling, even at night. Come when the desert winds have calmed and evening temperatures Try not to give children money or candy. If you feel the need, pencils and pens might be OK but remember that the children will just keep asking others when they come. It’s a terrible circle. Instead, play soccer with them and interact with them if they invite you to their house. A sip of tea is a gesture that gets you a long way in this traditional country. About the Meals During the trek : meals are cooked by our Berber muleteers. The food provided is fresh and healthy. For Breakfast: Jam, bread, cookies, fruit, juis, butter, coffe, milk. For Lunch: Salad, tomatoes, carrots, Lentils, beens, riz , Pasta seasonal fruit, and fish (sardines, tuna). For Dinner: Soup, Tajine, couscous, olives, nuts, Fruit etc. About the Luggage : Personal baggage, cooking equipment and food are carried by the mules, leaving you to carry only a rucksack with whatever you need close at hand for the day. Treks Flexibility :All our treks are private and thus tailor made to your party's needs: from easy to strenuous, from day-treks to week-long expeditions. They may start on any day to fit in with your personalized itinerary. We can advise on which of the exciting range of options best suit your itinerary, date of travel and ability. Your bags are carried on mules on all overnight treks. Culture & History - Moroccan culture is a melange of various ethnic and ancestral relations. Today, the country unites itself through the practice of Islam and the general acceptance of different cultures. Morocco has seen a fair-share of people coming to their land, so foreigners here are as commonplace as anywhere. The two distinct peoples of Morocco are the Berbers and the Arabs. Of course, the mixing of the two has taken place for centuries; to be wholly one or the other is probably not in all respects possible. The main languages of Morocco are Arab, French and Berber. Most Berbers live in the outlying countryside and mountain villages while the Arabs assemble more in the cities, such as Casablanca, Fez and Rabat. No matter whom you meet in Morocco, however, it seems that people are always warm and welcome to visitors. Rafting - If you want to raft when on Morocco holidays, you have really only one season. When the winter snows start melting in the High Atlas Mountains, rafting begins. This usually starts in March and runs till the middle or end of April—it totally depends on the snowmelt and rainfall. The Ahanssel River offers up some of the most out-of-the-way locales, with a snaking gorge and houses dangling from the tops of cliffs. The scenery is fun and the rapids are a class level manageable for a family. Wildlife - A lot of the bigger wildlife in Morocco has been eradicated for some years now. Unless you slice into the pie of Berber myth and the stories of leopards and lions still roving the cliff sides, then there isn’t really any big game left in the country. However, some of the best birds in the world can, at some point in the year, be found here. Additionally, there are scores of other animals that live high in the mountains, roam the level plains and swim through the water. Mountain Biking - The sport of mountain biking is growing tenfold in Morocco. The routes through and around the Middle and High Atlas Mountains are as technically challenging as they are beautiful. On your Morocco vacations you’ll pass through some of the most remote villages in the world—a world all its own! Most tour operators hook you up with all the details you’ll need to know. It’s often a good idea to bring your own bike in tote. Recently, bike trips through the Draa and Ziz Valleys of Morocco have become more popular. Routes to and from the Todra Gorge in the south give visitors a real feel for the country’s diverse people and topography. We requires all clients to have insurance cover.Accidents, medical emergencies or other problems can occur on holiday in any country and the resulting costs can be significant. Travel insurance is there for your peace of mind in case something goes wrong, and it should cover any activities that you are planning to participate in You must absolutely have insurance, covering, the accidents, medical repatriation, and mountain rescue and repatriation helicopter. You must imperatively provide us before the departure, a Telephone number of your insurance. Please feel out the form below ans send it to us before departure of your tour.